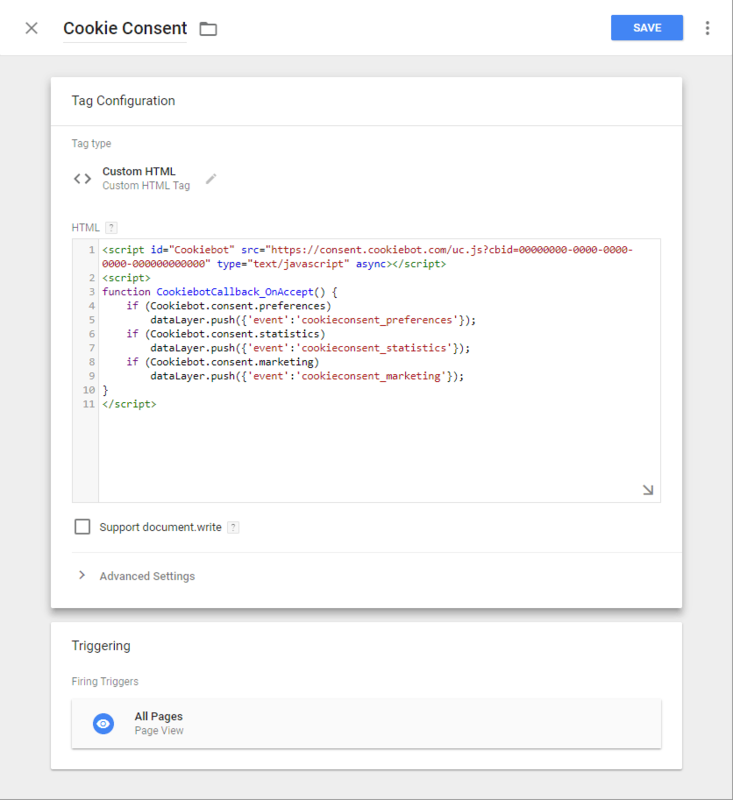 Websites using Google Tag Manager (GTM) can easily deploy Cookiebot by following these step-by-step instructions. Please note: You can't just copy the Cookiebot script tag from the Cookiebot Manager, you need to move the 'cbid'-attribute inside the URL as described above, because GTM will strip the attribute 'data-cbid' from the default script. Without the 'cbid' URL-fragment, Cookiebot will not display on your site when served through GTM. Choose "All pages" as trigger and apply a name to your tag at the top of the configuration page, e.g. "Cookie Consent". Click "Save" to create the tag. Also, make sure that you have registered and saved the domain name(s) of your website(s) in Cookiebot. 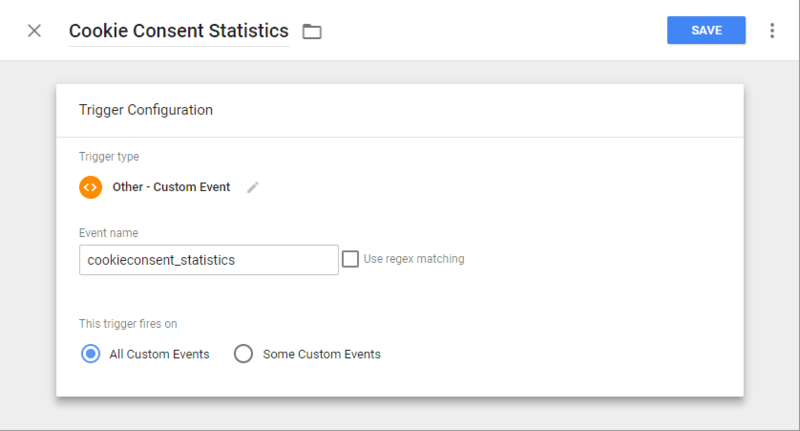 If creating a new GAU tag, select "Universal Analytics" under the "Choose tag type" pane. 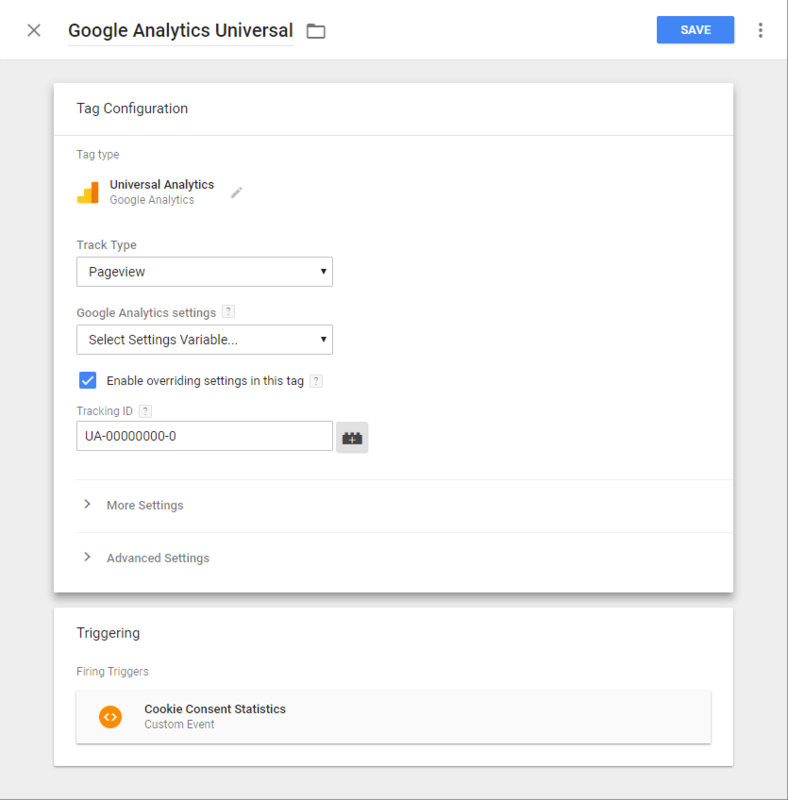 Select "New Variable" in the select box under "Google Analytics settings" and enter your GAU Tracking ID (available from Google Analytics) in the field "Tracking ID". Click "Save". 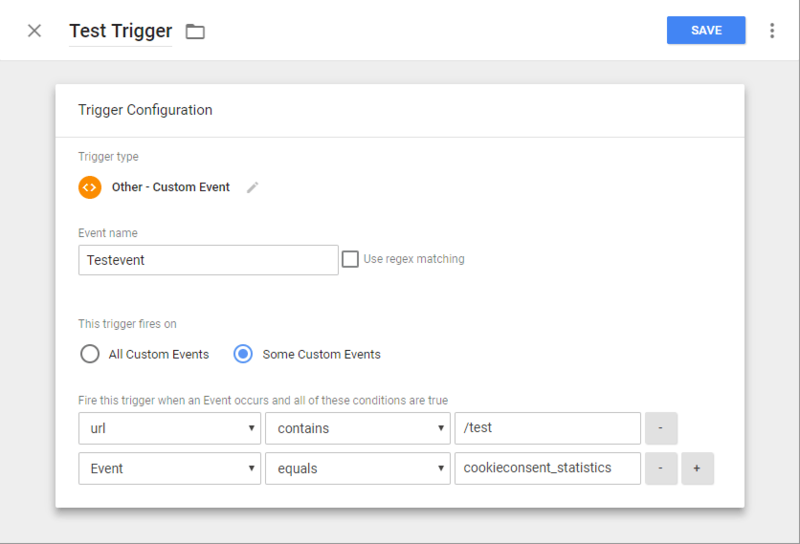 As trigger, select the trigger you have just created, "cookieconsent_statistics". Click "Save" to create or update the tag. From the Tags list create a new "Custom HTML Tag". In the field "HTML" copy/paste the snippet below and replace the Cookiebot serial "00000000-0000-0000-0000-000000000000" with your own serial as described earlier. Also make sure that the variable "contentPlaceholder" is set to the correct HTML element on your page, i.e. by renaming the element id "bodycontent" to the id of your own placeholder element. Under the "Triggering" section, select the trigger you have just created. Click "Save" to create the tag. 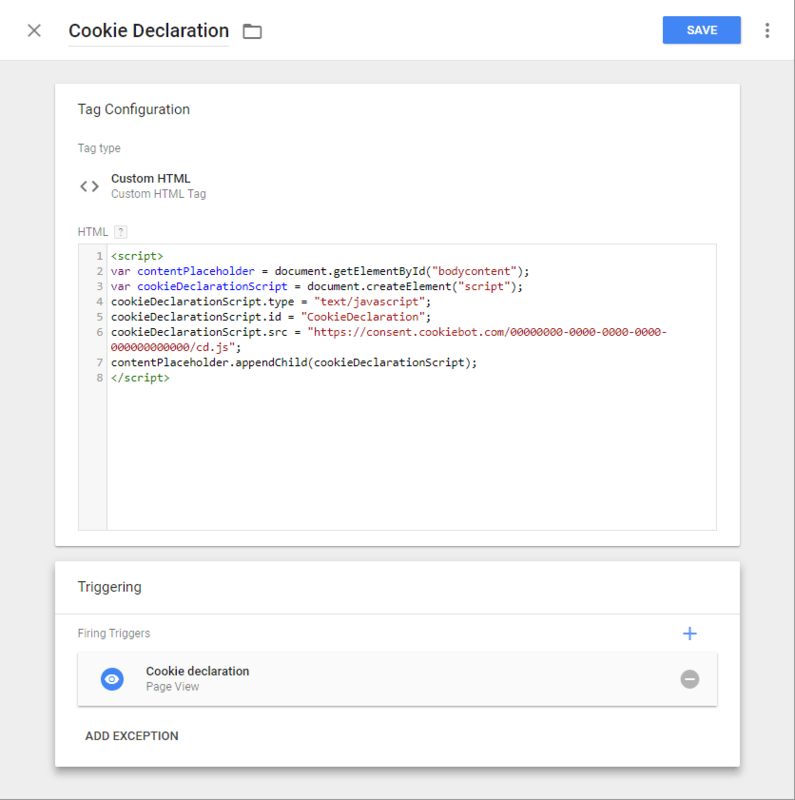 For instructions on how to make the cookie banner change language depending on which (language) part of your website a visitor navigates, please see Multilingual support when using GTM. I maintains many wix website but this I followed the procedure but it does not work.